During the 1990s, the world witnessed the worst conflict since the end of World War II. The violence, bloodshed and ethnic cleansing within the Former Yugoslavia was unthinkable. The conflict began after Bosnia and Herzegovina declared its independence on February 29, 1992. As a result, a group of Bosnian Serbs rebelled and created their own republic, the Republika Srpska. With the support of Serbian president, Slobodan Milosevic, the Bosnian Serbs gained territory throughout three years of killing and ethnic cleansing. Fighting ensued for several years between Bosnian Croats, Bosnian Serbs and Muslims. After the events and widespread media coverage of the shelling of a Sarajevo marketplace, the Srebrenica massacre of 8,000 Muslim men and boys, and the capture of UN peacekeepers as hostages, the goal of a successful peace agreement became imperative. After many failed attempts for peace agreements by the United Nations, the European Union and the United States, a successful peace agreement finally came to fruition — the Dayton Peace Accords. The road to the Accords was long and bloody. Negotiations to stop the violence began in November 1995, four years into the war. 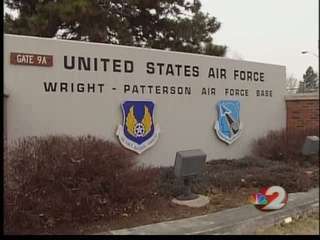 The main negotiations and signing of the Dayton Peace Accords occurred at the unusual location of Wright-Patterson Air Force Base in Dayton, Ohio. The main individuals in the Accord included U.S. lead negotiator and Assistant Secretary for European Affairs Richard Holbrooke; Serbian President Slobodan Milosevic; Croatian President Franjo Tudjman; and Bosnia Herzegovina President Alija Izetbegovic. 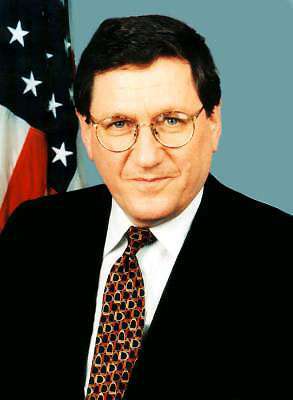 During the lengthy negotiations, Holbrooke focused his attention on Milosevic due to the latter’s cooperation and leverage within the region. While the Accords went smoothly it was not without threat to leverage the heads of state to cooperate and take the negotiations seriously. The parties were able to eventually reach an agreement and the Accords were signed on December 14th, 1995. Rudolf V. Perina recounts the Dayton negotiations, the events prior to them and the roles of Richard Holbrooke and Slobodan Milosevic in the negotiations. You can read about Perina’s experiences as Chief of Mission to Serbia and his dealings with Milosevic in the lead-up to Dayton. You can also read about Perina’s experiences negotiating on Transnistria, Nagorno-Karabakh, and South Ossetia, as well about Tudjman and the fatal crash of Commerce Secretary Ron Brown’s plane. PERINA: [Richard] Holbrooke (at left), had been briefed on [President of Serbia] Milosevic by [Deputy Assistant] Bob Frasure and me and knew a little of what to expect. I think both Milosevic and Holbrooke found each other interesting as personalities and had an incentive to engage one another. Milosevic saw a deal with the U.S. as the path to lifting sanctions and gaining respectability in the international community, and Holbrooke rightly saw Milosevic as the key person to resolving the Bosnian conflict. Holbrooke was the right person for dealing with Milosevic. For one thing, he could simply outlast Milosevic. These negotiating sessions sometimes went late into the night, sometimes until three o’clock in the morning and start again at six o’clock. I think one session went all night. Holbrooke really had the energy to do this. I think Holbrooke also found Milosevic an interesting person. You could engage with him more easily than with [Bosnian President] Izetbegovic or [Croatian President] Tudjman. For one thing, he spoke English so well. You did not need the formality of interpreters. It makes a big difference in discussions. Of course, that does not mean Holbrooke liked Milosevic. I think we all recognized that this was an unsavory man with a lot of blood on his hands. Perhaps because of this, there was a real challenge in dealing with him. We saw the cables, and we followed all of the press reports [to know what was happening]. I knew the Ambassador, John Menzies. But until we were together at Dayton, we did not have much direct interaction. The link between all three capitals — Belgrade, Sarajevo and Zagreb — was Holbrooke and his traveling entourage. And one of the interesting things about Holbrooke, which I am sure frustrated a lot of people in Washington, was that he never reported on his meetings through cables. In the 20 or so visits by him to Belgrade, we never did a single reporting cable. 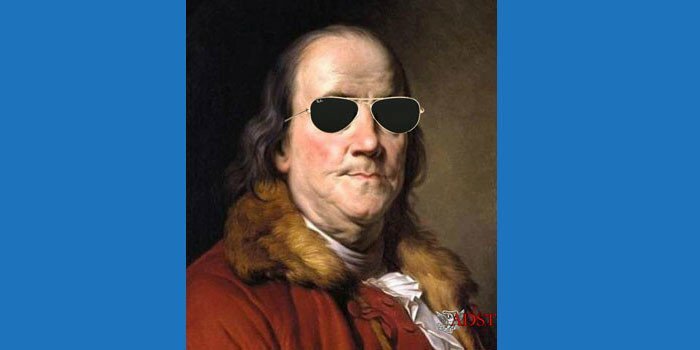 He always said– and he was right in this– that the more you report, the more Washington starts interfering in the negotiations. Interagency groups are set up, instructions drafted and circulated, a lot of people who want to get in on the action start appearing, and generally they are not helpful. What Holbrooke did was to call [Secretary of State] Warren Christopher periodically and brief him orally on the talks. Then, if anyone wanted a telegram, he would just say that he had already briefed the Secretary and that was that. And he got away with this as far as the State Department was concerned. It was a little tougher with the other agencies, particularly the Defense Department, because they did not trust the State Department, either Holbrooke or Christopher. That is why there were so many DOD, [Department of Defense] representatives on the delegation whom Holbrooke had been obliged to accept as part of the initial decision to launch talks. These people were all doing their own reports back to their agencies in Washington. In particular Wes Clark, as the representative of the Joint Chiefs of Staff, would run off after every meeting to send a report back to his people in the Pentagon. Holbrooke knew this, and it irritated him, but there was nothing he could do about it except — later in the process — start having some very private, one-on-one meetings with Milosevic to which the agency reps were not invited. The option [of bombing the Bosnian Serbs if the talks did not succeed] was always there, and Milosevic did understand it because in fact before Dayton it happened. We did bomb the Serbs in Bosnia briefly, and there was a huge demonstration, several thousand people, in front of the Embassy. It was one of the few times I was really frightened about things getting out of hand but there was an element of orchestration in the demonstration so that Milosevic did not let it get out of hand. It looked very threatening but remained peaceful. All of this was very ironical because the Embassy had twice been evacuated before the Holbrooke talks when we were threatening the Bosnian Serbs with military action. In each of these cases, all dependents and non-essential personnel were evacuated to Budapest in advance of possible bombing. In each case, the bombing did not happen, and people returned to Belgrade after several days in the Kempinski Hotel in Budapest. After the second time, it became silly, and the Serbs started making fun of it. They photographed the automobile convoy on the way to Budapest and made jokes about it. So then when we finally did take military action shortly before Dayton, the whole Embassy was there and no one had been evacuated. I cannot now remember what finally triggered the bombing but the point was primarily to show the Serbs prior to Dayton that we were serious. Holbrooke wanted to show that there were teeth in the threats after all. But it all happened on short notice and no one had time to evacuate the Embassy when we finally might have needed to do so…. The basic elements agreed with Milosevic were that Bosnia would remain as a single, unified state consisting of two entities, the Serb Republic or Republika Srpska as the Serbs called it, and the Muslim-Croat Federation. The two entities would have a lot of autonomy, including their own parliaments, but there would be a central Bosnian parliament and governmental structure, a central judiciary and so on. There was a rough outline of the division of powers among these entities and the key institutions that would be created but otherwise all the details were worked out at Dayton. That is where we had the real experts, the lawyers and others to put flesh on the bones. Well, Holbrooke rightly did not deal with the Bosnian Serb leaders Karadzic and Mladic. They were simply too tainted by the atrocities committed. That is why he dealt with Milosevic, and why Milosevic was key to the negotiations. One of the fundamental problems through the talks was that we needed to negotiate with the Bosnian Serbs but could not do so directly but only through Milosevic. Milosevic thus knew how important he was to the whole process and hoped to redeem himself and his entire career by helping to make Dayton succeed. There was the one episode that Holbrooke describes in his book when Milosevic persuaded us to have a meeting with Karadzic and Mladic. He organized it at a house on the outskirts of Belgrade. It was the only time that I also met with Karadzic and Mladic because, of course, they were not invited to the Dayton talks. They impressed me as rather sullen and unfriendly. They were, of course, very unhappy with the position they had gotten themselves into. Through their actions in Bosnia, they had become politically radioactive, and thus Milosevic held all the cards in the negotiations, and they as well as Holbrooke were dependent on him as an intermediary. Q: How did the Dayton meeting come about? PERINA: Well, once the Serbs, basically Milosevic, agreed to the basic principles and structures of a settlement, it was understood that there would have to be a meeting of everyone involved to flesh out the agreement and sign it. You must remember that all of this took place before Milosevic, Izetbegovic and Tudjman had even gotten together in one room. There were actually many key issues still left hanging before we ever got to Dayton. Dayton was not just a paper exercise of filling in the blanks. We knew that there would be high-level talks as well as much detail to work out. Many people had to be brought together. For a while, there was talk of doing this in Europe, but Holbrooke wanted to retain control of it in the United States. Interestingly, Milosevic also wanted the meeting to be in the U.S. I am not sure how in the end the decision was made for Dayton but it made sense to do it on a military base where facilities would be available and access could be controlled. I heard subsequently that Dayton was chosen because it was Strobe Talbott’s home town and he suggested it. I was Milosevic’s keeper at Dayton. Each of the three chiefs of mission came out with their head of state — Peter Galbraith accompanied Tudjman from Zagreb, John Menzies from Sarajevo accompanied Izetbegovic, and I came with Milosevic. The job was to get them to Dayton and be a contact point in dealings with them. I received permission from the Department to fly to Dayton with Milosevic in the private plane that carried the entire Serb delegation. There were some Serbs who came separately from Bosnia, from Sarajevo, but not Mladic or Karadzic who wanted to come but were told they could not. So the Serb delegation from Belgrade was basically Milosevic and Milutinovic and then some military people and intelligence types. For some reason, Milosevic also took this American advisor Chris Spiro to Dayton. During the talks, I participated in most of the meetings involving Milosevic, though not all because there were a few meetings just exclusively between him and Holbrooke. 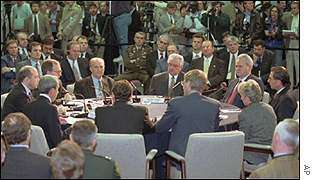 As the talks got more detailed, they broke down into working groups of experts in which Milosevic did not participate. I spent a lot of time trying to keep an eye on Milosevic and the Serb delegation, and there was a lot of down time as is usual in these types of negotiations when people just mingled and chatted in the restaurant or coffee bar. Milosevic and the other Serbs of course got a little antsy by being restricted to the air force base, Wright-Patterson. They were always coming to us and asking for permission to leave the base and go into town. We let them do so only once when I accompanied them to a shopping mall in Dayton. It was only about a dozen Serbs, but we had to have a lot of security from the U.S. so the entourage was very noticeable. The Serbs walked around looking at the stores and buying things. Some of the lower-level people bought quite a bit of stuff and were excited by all the stores. I remember that Victoria’s Secret caused a stir and a lot of jokes. Milosevic, as I recall, bought a pair of shoes in a department store. I am sure he did not need a pair of shoes but he probably wanted to make the point that he had been off the base and allowed to buy what he wanted. These were, after all, people who for years had been under sanctions. There was thus something symbolic for them in getting off the base and buying things—it documented what they saw as the end of sanctions and of being international pariahs. And of course, there were Serb journalists and TV crews there to report on this. This was the only time we let Milosevic off the base. The Serbs wanted to make excursions a number of other times, but we told them that they could not because of security concerns. And we also did not want them wandering all around Dayton. That was the whole point of conducting the talks on a military base. But we did forget about one thing — the PX [Post Exchange]. We learned that the Serbs had started visiting the PX and buying things there, including U.S. military gear and uniforms in fairly large quantities. We had not thought of this, and the image came of Serb troops outfitted in U.S. gear that the Serbs had procured in Dayton. Holbrooke got really upset, and we had to tell the Serbs that they could not do any more shopping at the PX. The key ally and contact group [for European] countries were there but with a very symbolic presence. Most countries had just one person report on events. These people were largely observers — they were not involved in the negotiations, and generally they were out of the loop. Of course, most people continued to be out of the loop because that was still Holbrooke’s negotiating style. On the big issues, he would report to [Secretary of State] Warren Christopher and through him to the President but try to keep as much of a close hold on information as possible. The Europeans were allowed to be there symbolically because we all knew that in the end we would need the Europeans. NATO would have a post-Dayton role, a vast amount of reconstruction assistance would be required, and so on. But by and large, Dayton was a U.S. show, and really Holbrooke’s show. I think Holbrooke deserves a lot of credit for what was accomplished in Dayton. Certainly the agreement did not bring love and everlasting peace to the Balkans, but it did stop the fighting and the bloodshed, and that in and of itself is a very significant accomplishment. Now I also think — and I believe Holbrooke would agree with this — that Milosevic did a lot to make Dayton possible. This does not absolve him of his complicity in starting the whole conflict but it is a reality that should be understood. Milosevic operated much like Holbrooke in keeping a lot of information to himself and not sharing it. He cut the final deal in Dayton with Holbrooke, making an agreement possible. 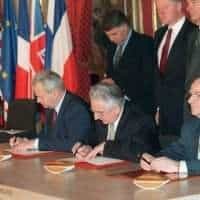 Many members of the Serb delegation did not know what was in the agreement until shortly before it was signed. In fact, there was a rumor that I cannot confirm that at least one member of the Serb delegation, a person from Sarajevo, passed out when he saw the final text. There was a lot of unhappiness with parts of the agreement that Milosevic had agreed to but none of the other Serbs could do anything about it. There was a lot that made them unhappy, including the basic fact that Republika Srpska would not become independent but remain a part of Bosnia. But this was not a surprise to anyone, and all the Serbs knew this was coming. What really upset them were some of the more detailed provisions on return of refugees, property rights and restitution of property. Basically, the agreement said that all of the Muslims who had been ethnically cleansed could go back to their homes and reclaim their property. This would reverse all of the results of the ethnic cleansing that the Serbs had perpetrated. 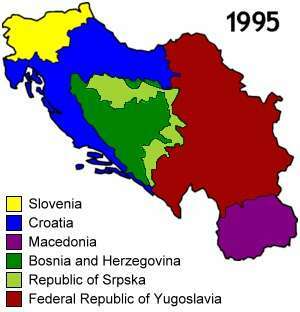 But then in addition, many of the Serbs were shocked to see how the boundaries were drawn between the Serb and the Federation portions of Bosnia, and also of Sarajevo which was divided into sectors. In effect, some Serbs found that they would be living in Muslim-controlled areas. The person who reportedly passed out was a rather affluent Bosnian Serb who suddenly learned that his entire estate would be in a Muslim rather than Serb part of Sarajevo. As I mentioned before, Milosevic could agree to such terms because he was not really a Serb nationalist. He did not care that much about Serbs. He cared about Milosevic. He thought that by helping to conclude an agreement at Dayton his past actions would be forgotten and he would gain legitimacy and respect. But he was wrong. Kosovo was still outstanding, and it would prove to be his downfall. Q: Was he still afraid at Dayton that Serbs might be bombed by the U.S.? Was that also a motivation? PERINA: Perhaps it was. Certainly bombing was never off the table. But this reminds me of another anecdote about the technical support we had at Dayton from the military, which was really impressive. The process of deciding the borders between Republika Srpska and the Federation was one of the hardest parts of the negotiation. It amounted to sitting down and dividing a country on maps, deciding which side gets this village and that road. Numerous disputes came up. In one example, the disposition of a country road depended on whether it was passable in the winter or not, and there was an argument on how wide it actually was. Well, the U.S. had developed a wonderful way to deal with these disputes. We had virtually all of Bosnia on aerial film. There was a room set up at Dayton with several very large TV screens. In the case of this road, for example, we could go to this room, ask the technicians to find the road, and literally fly over it, even changing altitude within a certain range. The delegations that saw this technology were really amazed. One day, Holbrooke found a pretext to take Milosevic into this room and show him how it worked. Milosevic was also amazed. But, of course, the film had not been put together for the purpose of helping the Dayton negotiations. It had been put together by our military for the purpose of possible air strikes within Bosnia. Holbrooke knew this, and he intentionally wanted to remind Milosevic of it. I am confident Milosevic understood and got the message. It was in fact very impressive technology for its time. Nowadays, of course, it might not be any more impressive than Google Earth. I found Milosevic very interesting but I would not say I grew more sympathetic to him. On the contrary, as we discussed earlier, the more I knew him the more I recognized how strange he was and what a perverse view of the world he had. With him, the first impression was better than subsequent ones. But I would say that over my entire tour in Belgrade I grew more sympathetic to the Serb people. They had acquired an extremely negative image in the West as almost a nation of rapists and war criminals. This was unfair. I came to know many, many good and courageous Serbs who were as opposed to Milosevic, Mladic and Karadzic as anyone in the West. They were paying the price for having a very bad leadership which allowed the worst elements of society to come to the foreground. I don’t think that Serbs are inherently any better or worse than other nationalities in the Balkans. But they have to this day acquired a very negative image in the minds of most people in the West.…. I never witnessed a shouting match [between Milosevic and Holbrooke]. That was not Holbrooke’s style, nor Milosevic’s style. Milosevic wanted always to show how unflappable he was. And Holbrooke’s real strength was his persistence. He would never give up, even when somebody else might say this is impossible and walk away. It was often just a matter of physical duration and energy. Holbrooke could go on very little sleep at night. I saw this already in his visits to Belgrade. He could go on two hours of sleep at night. Then in the car on the way to the airport he would say “I have to rest for 10 minutes.” He would close his eyes in the car and wake up ten minutes later and be all energetic again. Both Milosevic and Holbrooke were like that. But toward the end of the Dayton talks, Holbrooke did put on this big bluff that he would declare the conference a failure unless all three presidents signed on. We in the U.S. delegation were actually instructed to pack our bags and put them on the sidewalk in preparation for pick-up. He wanted it to really look like he was ending the conference and would declare it a failure. I never heard Holbrooke say directly we’re going to bomb if [the conference] doesn’t work. But as far as the Serbs were concerned, certainly there was an implication that the sanctions would get worse, the isolation would get worse, and we would under no circumstances allow Republika Srpska to secede from Bosnia. In other words, no matter what the Bosnian Serbs did, they would not achieve their main objective of breaking off from Bosnia. We would make sure of that, not through direct military intervention but rather by supporting the Muslim-Croat Federation and changing the military balance within Bosnia if the fighting continued. So logically, the best deal for the Serbs was what they could get in Dayton. [The Accords] were actually signed twice. There was a signing ceremony at the end of the Dayton Conference in November, and then there was a formal signing ceremony in Paris in December which the French very much wanted (below). Holbrooke agreed to this because we needed the Europeans to help implement the agreement and also because the Paris ceremony was pretty much deja vu. The really significant event was when the three presidents signed the agreement in Dayton. Many of the Serbs in the delegation, as I mentioned, were devastated. They saw the Agreement as a total sell-out. But for Milosevic, it was a real moment of triumph. Here he had moved from being a sanctioned pariah to being a peacemaker on television screens around the world. Congratulations to the three presidents came from everywhere, including from President Clinton at the White House. I really think Milosevic believed at that moment that he had managed to change his image and shed his pariah status. But we had not forgotten about Kosovo, and Kosovo was yet to be his undoing.